Continuing the feature-length television adaptations of Valerio Varesi’s detective novels, this third and final season of Fog and Crimes takes Soneri (Barbareschi) out of his natural climate of Ferrara and moves him to the big city of Turin. Bringing a dark complexity to the demanding nature of police work, and highlighting the difficulties of any kind of relaxed personal life, this quality drama creates a gripping structure that brings successful closure to the series. Other than the change in city, the main difference this time round is in the supporting cast. New assistant Todisco brings a comedic side to the plot as Juvara did in the first two. But it is the additions of Anna Valle as medical doctor Chiara and Celeste Cuppone as runaway child Immacolata where the cast mostly differs. Both of these new characters bring an added warmth and humanity to the tough cop. The tightly formulated plots of the four gripping tales provide depth and many surprising twists. The ongoing story of Soneri’s relationship break-up with the first two series’ Angela (Natasha Stefanenko) is alluded to at the start and end nicely bringing the series round to a conclusion. The disc itself is pretty much bereft of extra features, although the Arrow Films trailers and booklet give a good idea of where the label is trying to go with its priorities for Euro-Crime drama. This release joins other Italian series on the Arrow Films sub-label ‘Criminale Italia’ such as Gomorrahand Romanzo Criminale. 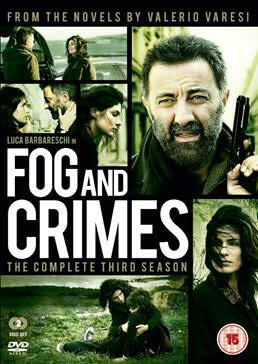 Well worth checking out for all crime and mystery lovers, Fog and Crimesended on Italian TV screens back in 2009 and is fully deserving of a new audience. Nanni Moretti, an Italian master at fusing emotionally engaging stories with a rich vein of comedy, has done it again. Mia Madre (My Mother) is a warm-hearted, touching and often hilarious personal account taking in as many sides of life as human existence is capable of dealing out. 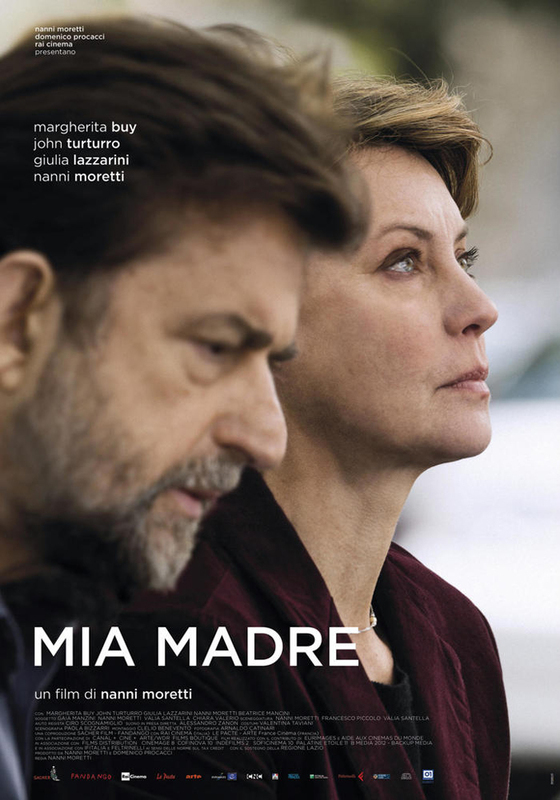 Concentrating on Margherita’s (Buy) struggles to complete her high-minded social realist film about job losses, economic crises and factory closures, Mia Madre does a fantastic job of contrasting the movie world with real life family concerns. Moretti does this by alternating between the occasionally farcical difficulties Marguerita faces on-set with the emotionally overpowering stress of her mother Ada’s (Guilia Lazzarini) faltering health in hospital. The arrival of the naive, playful and egotistical American actor Barry Huggins (John Turturro, wonderfully enjoying himself) adds a further complication to Margherita’s constant juggling of work problems and familial strains. She is helped out by her brother Giovanni (Moretti, adding solid support as character and actor), who is able to cope with many of the demands of visiting their mother having taken leave off work for undisclosed reasons. Both Margherita and Ada, a retired academic, have found a high level of success in their chosen careers – this contrasts with the manipulative and scheming Huggins, who although charming and intrinsically funny, is not all that he says he is. Taking more of a back role in his portrayal of Giovanni, is interesting, for one gets the feeling that this is a deeply personal story for Moretti, and that in some respects he has put himself in the shoes of Margherita. This gender switch brings out another range of political and societal issues, with the context of gender equality touched upon subtly as a background piece. Moretti is a film-maker who gets to the heart of terrifically complex ideas. All of his films show off a keen awareness of memorable ways to showcase comedy, tragedy and serious political points in expert style. Out of all his films this rivals The Son’s Room for sheer emotional impact. Some may find it difficult to deal with the mixture of the slapstick scenes from Turturro’s character with the family agonies of losing a mother, but the integrity and honesty of the whole production is never in doubt. I must confess to being a bit of a n00b when it comes to Leet, the coding geek-speak tellingly referred to in Atomic Robo – the Ring of Fire #1. That’s something that got old without me even noticing it. As with Atomic Robo – a great looking comic book saga created by Brian Clevinger (8-Bit Theater) and Scott Wegener that has recently joined the ranks of IDW publishing – there are vast swathes of the comic book world that happened without my knowledge… oh well, I’m sure they’ll get over it. Anyway, as with many other long running stories, getting into Robo isn’t completely straightforward. The reader is pitched headlong into the weirdness of the story’s parallel world and must contend with panel after panel of groundwork on what’s proceeded. As a narrative device this is a bit cumbersome, but as with all introductory sessions there’s bound to be a little discomfort! Thankfully, Wegener’s artwork is engaging and vibrant, with a classic cartoonish take on layout and style. 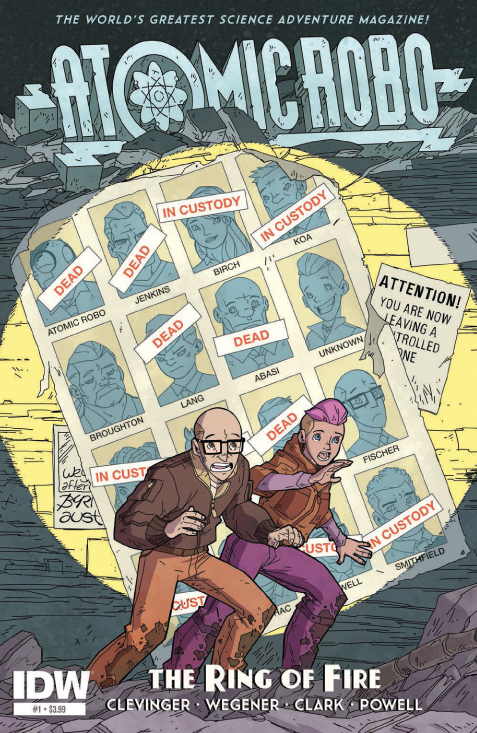 The plot itself – as far as I could discern – largely focuses on the Action Scientists attempts to locate where their leader Atomic Robo is. He’s been missing for two years and the team has got back together to try and figure out exactly where in space and time he is. Oh, and they’re also trying to escape the attention of the heavily armed militaristic group ULTRA. While Robo himself only makes the briefest of appearances, there’s enough in this issue to intrigue and create anticipation for further progression… however, some background reading is recommended. Review appears on the pages of Flickering Myth. Carter burns through his money like a big-baller. Also, we see The Scalinas death at the hands of deadly daughter Nicole. 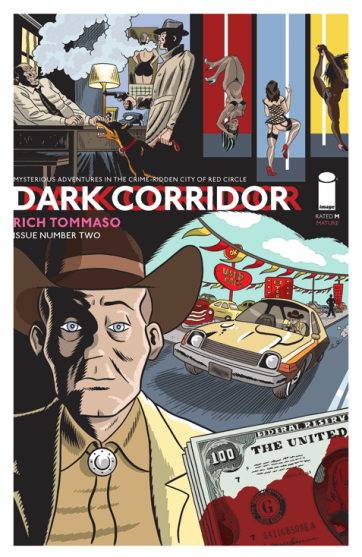 Issue 2 of Dark Corridor continues Rich Tommaso’s rich and bloody vein of neo-noir in combative style. Set around two ongoing stories; The Red Circle and Seven Deadly Daughters, Tomasso (Clover, 8½ Ghosts) creates an exhilarating ride through two distinct constructs taking in a range of largely cinematic influences. As Tommaso writes in his last page commentary, cinematic entertainment has played a large part in his creative imagination. He cites violent action movies of a certain vintage like Commando,Predator, Lethal Weapon, Scarface and many more as having made a huge impact on his life. He also describes how he turned away from these features and sought out more ‘intellectual’ filmic pursuits after reaching the grand old age of 21. With a bit of time to digest however, he returned to the wide-screen actioners and in particular, the 80’s horror and violent splatter-fests of his younger days. So, what does all this have to do with his comic book? Well, quite a bit, as Dark Corridor is imbued with a Hollywood style of classic cinematic crime and noir. The two ongoing stories take a slightly different tone with The Red Circle using a classic noir template, calling to mind that great comic book artist of city crime Will Eisner (The Spirit). Seven Deadly Daughters on the other hand has more of an updated 80’s feel to it, with a distinctly Tarantino-esque rapid fire delivery. Tomasso’s art work fits perfectly a portrayal of a city’s 50’s style crime underbelly. The world of Red Circle is timeless, with classic themes of Americana running throughout. The style is vibrant and hard-hitting. The cumulative energy built up around Carter’s long day and night of freedom is impressively displayed with Carter’s internal monologue accompanied by time and location run-downs on the base of the panel. The Seven Deadly Daughters story, Greatest Hits volume 2, centres on Nicole Breccia and her quick-fire revenge on her father’s murderers. The story is fully turned up the max, with panel after panel of kicks, knife fights and dog attacks going on with no pause for breath. Essentially played out as a mini scene in an ongoing story, the chapter does more than enough to keep you wanting more. Overall Dark Corridor is a great example of what comic books do best – provoke, entertain and inspire in equal measures. I, for one, am looking forward to reading more.